I just wanted to let you know that I received the name plaque yesterday, and it is beautiful! Thank you so much for your excellent work. I will send you a photo once we have mounted it. Thanks again, and I hope you have a great weekend! Thanks Robin. Received this morning. The motif looks great. Thanks again. I collected my deco house number sign from the post office today and I had to say I’m very pleased it. The best part is that it’s handmade and painted. 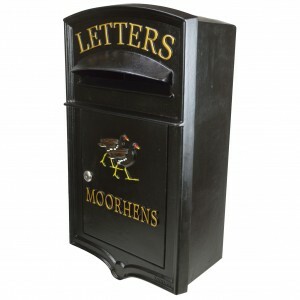 Just wanted to let you know that we are very pleased with our new letter box. 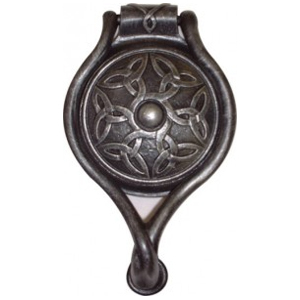 The finish is excellent and the Tudor Rose design is beautiful, just what we wanted! Many thanks for a quality job. Hi Robin, just to let you know the plaque arrived safely, thanks for a great job. Just to let you know that our postbox has arrived and it is absolutely stunning,thank you so much. Hi Robin – not sure if I ever let you know, but the plate arrived successfully and looks great! Just to let you know that I received the house sign today, thank you, am delighted with it. ITS HERE AND IT’S PERFECT!!!! THANK YOU SO MUCH!!!! I haven’t even told my husband it’s here yet – I was so excited to see how it had come out that I had to run email you first haha! It couldn’t have come out better – It is phenomenal! I will send you a picture after we get it hung up…Thank you again – this is amazing! I was able to collect the trivets from the local shipping company depot. There had been a system error with my name on the parcel. Now let me say: WOW these are beautiful! Your work is excellent. Thank you so much! Is there a website or something where I can leave a review? Just to let you know I returned from my business trip yesterday and have now opened and installed the various house signs. I’m very, very happy with them. You’ve done a terrific job. Received your delivery – we really love the finished products, thank you so much for this. I’m sure once our family see it fitted – you will get a few more orders! Happy to recommend your services to others. My sign – Webster House – arrived yesterday. I just want to tell you that it is beautiful and I am delighted with it. My house in Ballarat, Australia, will wear it proudly. I received the sign and it looks just great. Thanks so much! I received the sign today and wanted to let you know that it’s just perfect! Thank you for your collaboration and excellent craftsmanship! Well, I fitted the Royal letterbox plate on Sunday and it looks fabulous. The quality seems great and the cost difference between yours and other equivant plates is quite dramatic. I know that there was a slight issue with the original delivery, but the way that you dealt with it was absolutely super. Not only will I definately order again, but I will certainly have no hesitation in recommending you to my friends and family. Vendor, service and product fabulous. We got the sign last week, many thanks! It looks amazing and exactly how I expected! We wish you even more orders and lots of happy customers! Just a brief note to say thanks for the post box. it looks great on the front of the house and we have had half a doz enquiries already. I just wanted to say how pleased we are with our house sign – once up on the wall I will send you a photo. Thank you for your prompt service and help during the process, it’s not very often things go as smoothly or people deliver as promised. I wanted to let you know that I received the sign yesterday and I am very pleased with it. The silver text looks good and the size of the text is perfect. Thank you for your excellent and very prompt service, I will definitely use you again in the future if I need any more signs!!! As promised sending you a photo of the plaque in situ, we are really thrilled with it thank you for your work and expertise. If you are passing please knock the door and say hello. Many thanks for the trivet. It arrived safely and looks great. My daughter is highly delighted. Here’s the result of the sign you made for my mum earlier on in the year. You are very talented & the sign is just perfect!! To let you know you will probably be receiving some more orders as I’ve spread the word round the area our parents live in as they all love the sign! Thank you very much Robin. My Top Cat Kitchen trivet arrived today. I love it! I opened the package with much trepidation only to find a a fantastic result. If you ever need a testimonial then please don’t hesitate to call on me. Just wanted to let you know that we received our house sign and we are more than happy with everything. Thank you for the excellent service. Sign arrived today – looks great. Will look even better on the wall but too hot today for that job. Thought I’d send you a photo of your fantastic postbox, needless to say my mother is thrilled! I think you’ll agree it looks lovely. I received the articles today. Thank you for your polite and quickly response. All of your works are beautiful and respectable arts! They will become our favorite items. I am looking forward to the another opportunity to meet your further works. Apologies for the late email, I’ve been away most of this year! Just to say that the post box has arrived in perfect condition, it is still in it’s packaging so I’ve not checked it completely, as I’m going to take it down to my mothers to fit it next week. Also to say that the front of the box with lettering and the coat of arms looks absolutely fantastic! Such a great replication from the photo’s, my mother will I know be thrilled. Thank you so much for making such an exceptional job of it. We would love to have one ourselves, and will start saving!! The letter box plate arrived today – absolutely delighted with it. I will take a photo of it when it is mounted in situ. Just to let you know that the sign arrived yesterday. We are very pleased with it. It looks lovely and solid and I’m looking forward to positioning it when the ground thaws out! Thanks for all your help and all the best. I put the sign up today and it looks fabulous. Just wanted to wish you and your family merry Christmas and all the best for 2017! Robin, just a belated message to say thank you for the postbox. Fabulous quality, very pleased with design and lettering/number. Looks great too. I’ve received the trivet, Robin. Thank you very much it is fabulous – very pleased with it. I got my letterbox today! I absolutely love it thank you so much u did an amazing job!!! The sign has just arrived. Thank you so much it looks incredible… we are sooo happy. It has arrived! We are totally thrilled, the Harley letterbox was just what we were after. It is solidly built and beautifully designed. Just to let you know that my mum has received her house sign and absolutely loves it. Thank you so much for making it work so well. Thank you so much for getting the plaque completed in time for today. It is looks great, really pleased. The sign, the metal stake and the connection solution between the two are excellent – really solid and should certainly do the job. Thanks again for your help with this and as ever for the excellent service. Just a quick note to say thanks for the letterbox, after so many off the shelf items that either didn’t do the job because of bad design or such inferior quality that they didn’t last it is good to deal with a company that is willing to go that little bit extra, (although in our case I know it was a lot extra), to supply a quality item. The box looks great and is exactly what we needed – the modifications are just how I envisaged them. I am sure that many other people will benefit from the design. I wont hesitate to recommend you to friends, family and clients. I have received the cast iron sign and what can I say! A truly wonderful interpretation of what i envisaged. Thank you and your team for producing such a great piece of art, that will adorn our little Gite in France as soon as i can work out how to get it on the wall and do it justice. It looks absolutely brilliant and my wife is so happy. You really did make her Birthday. I will send you a photo once I have got it hung on the wall. Just wanted to send a quick E-mail to thank you for the wonderful service that I received when placing my order for my Chillington Post Box. It arrived yesterday (very prompt thank you) and we are over the moon with it. I will highly recommend you to anyone I know that requires your services. refurbishing to such a high standard – they look lovely, thank you again. All for now and best wishes. The plaque looks brilliant and everyone is so happy with it. If ever anyone needs a plaque I’ll recommend you. Received the plaque and we are absolutely delighted with the finished product. Thanks for your assistance in designing and for producing a very good looking plaque that will have pride of place in the village of Newhaven on Forth. I want to thank you for the wonderful letterbox. It is such good quality and we are delighted. I will be placing an order for a sign in the near future. I just received my order. I love it. Thank so much for helping me place my order. We received our deco house plaque this morning, much earlier than expected which is always nice! addition to our deco home. Thanks again for getting this to us so quickly and we will be sure to recommend you when we can. Letterbox has just arrived and it looks fantastic, thank you very much. We are very pleased with it. The plaque has arrived thank you. The owner of The Black Boy- third generation of his family to live there- is thrilled with it. Just thought I would send you a picture of the finished article. Thank you so much for offering your services. First class from our first conversation to the end. Belated thanks for house number. Extremely fast delivery of order and looks great now it is installed. The sign arrived this a.m. and is perfect and now in pride of place. The trivets arrived yesterday and they are fantastic! Thank you ever so much and for turning them out so fast! Have a good festive break! I have just received my letter plates (delivered by DHL on Sunday), needless to say that I am impressed with the quality. I would like to take this opportunity and congratulate you on your superior workmanship. Merry Christmas and Happy 2016 Year. Rather belated thanks for the sign you designed and crafted for us – we are delighted – it is absolutely wonderful! Just to say that we received our restored sign yesterday and to thank you for doing such a great job. It has been restored beautifully and it looks really fine. We have admired your choice of paint colours for the coach and horses and think that they are much better that the original ones. Hi Robin – Just to say the order arrived safely today, and to thank you. Excellent work, I am delighted with it. When we get it installed, I will take a photo and send it to you. Hi robin…..just a note to let you know box arrived safely and we are delighted totally with product, design and speed of response to our order. It looks good and I’m pleased with the results. The stake is a little longer than anticipated but it is not a problem. So, thanks again for the work. Nice to know that such an item as this can still be manufactured in the midlands in 2015.
received today. we will highly recommend you amongst our friends. Hope you are well – just arrived in Wolves and love the new sign. I received my order today and I just wanted to say thank you. I really appreciate you getting it to me so quickly and I am so pleased with it! Just wanted to say thank you very much for the trivet which I have just received - it is really lovely and just what I wanted. We received our "The Dale" letterbox this week and we are extremely happy with it. morning,we think it looks absolutely wonderful & exceeded our expectations. in doing business with you. Delivery has arrived safely, beautiful letterboxes, absolutely stunning. Many thanks also for the lovely trivet, it's perfect. I will certainly recommend you! Amazing' thanks so much for your work and your speedy service and delivery. I am so appreciative of your efforts to get it to me in such a hurry. Just wanted to say thanks very much for the house sign - it arrived today and looks great! The house sign "Fairview House" with the eagle arrived today and I am very happy with the outcome. So thank you very much and I wish you every success with your business and will keep you in mind for any other work I may need to have done. My paackage is her yay!!!! From across the world. Magnificent stuff. Many thanks for the great Art Deco Number Plate. I just love it and it was even better than I  envisaged. The sign arrived today. Thanks so much! The letterbox arrived today! Absolutely delighted with the quality and design! The sign arrived yesterday and I am delighted with it. Looks great on the pillar next to the front gate. See attached. Thanks very much for the extremely prompt service. Received my wall plaque today, absolutely love it, thank u so much. Sorry for late reply. Sign arrived Wednesday. Both the letterbox and sign are excellent. Thanks for swift reply and service and very well packaged. years, so Thank-you again for sending those. Thank you for restoring my house number plate which i received back from you on Friday, both my wife and i are very pleased with the ''transformation'' and we could not be more pleased. Hello Robin, Just writing to let you know that the mail box arrived today and we are delighted with it! We are waiting for gates to be made so we will be putting it on the gate post in a week or so. Thank you again for making such a lovely piece. Spike's plaque has been safely delivered  - thank you so much, it's lovely! Thank you very much for the two Sunbeam Letter Plates and Back Doors that arrived promptly and in good order. They are now built into the front wall and look very good indeed! Received my signs yesterday and just wanted to let you know what a wonderful job you have made. The quality and workmanship is clearly evident and I am delighted with my purchase. I will be ordering from you again already thinking of having a sign done for my sister for christmas. I will have no hesitation is recommending your services to friends and family. The fretted signs arrived and we are very impressed with them. The quality of the casting and the finishing is excellent. I have now mounted them on the wall of our house and the black signs look great against the white walls. The letter box arrived yesterday afternoon. We unpacked it this morning. It is just what we wanted. We like the quality, the design and the box size will adequately hold a week’s post. We are very happy with our purchase and will recommend you to anyone who asks. Just wanted to let you know that the trivet arrived safe and well, and looks fantastic! Thank you for all the help you've been with this. I just wanted to say thank you for sending the trivet so quickly and how pleased I am with it. It was a present for my father's 70th birthday and he was absolutely delighted with it. Very well made. The letter box arrived earlier this week. I have been working away from home this week hence only just sending this email. I just want to say thank you very much. The letter box is absolutely excellent. The quality is much better than I was expecting, it’s really solid and the finish is great too. I was also pleased to be able to buy a product manufactured in the UK. The plaque arrived today and it is perfect. Thank you SO much. A huge thank you to Robin for ensuring the dying art of good customer service is alive and well and great products. Many thanks for your help on this Robin. The sign has arrived and it’s perfect. The surface mounted bourdon letterbox I received today is top class,i am so pleased. We received the post box today and are thoroughly delighted. Everything is excellent, the quality, the finish and the packaging. I just wanted to say that I received the trivet last week and I absolutely love it !! It’s exactly what I was looking for (buying a pretty gift in wrought iron is no easy job !!). Many thanks for the letter plate that you made for us recently, we are absolutely delighted with it. I have attached some pictures of it in ‘situ’ for your interest. I have just received my house plaque- it’s absolutely beautiful!!!! Sign safely delivered and we’re delighted with it. My sincere thanks for all you’ve done – fantastic service. Just wanted to say a huge thank you for the plaque! I received it earlier and I am over the moon with it!!! It looks amazing and exactly what I was after!! My friend loved it to say the least!!! Thank you so much again. Hi Robin, the plaque has arrived safely and I am thrilled with it, thank you so much. Thank you so much! Dan just unwrapped it and LOVES it! You were so great to work with…thanks again! The post box arrived this afternoon and looks great, thank you so much – brilliant job!! I would just like to say that my sign arrived today and I love it!!!! It’s a present for my husband and I can’t wait to give it to him. I just wanted to drop you a line to say how delighted we are with our number sign. It arrived much quicker than we expected and is a lovely piece of craftsmanship – thank you! Thank you Robin! We received the mailbox and love it! Hi, I just wanted to say how pleased I am with our sign, it really finishes our building off nicely. In fact it has just arrived as I received your reply! I absolutely love it. It shows off your skill and craftsmanship, I am very happy I have found your company. The sign has just arrived and looks gorgeous. I just wanted to drop you an email to thank you for my Churchill letterbox. The order process was easy, the delivery time amazing (for such a personalised item) and the standard of manufacture/workmanship incredible. I wasn’t sure what to expect (when ordering online) but am delighted with the finished article. Just wanted to say I received the sundial this morning, and it’s beautiful! Thanks very much. I received the house sign and am really thrilled with it! It is really unique and so well made. Thank you so much!! I have received my house nameplate today and it looks great! all packed beautifully along with the Lumley stamped seal screw packet. What a joy to deal with a company who takes such pride in their workmanship and service, very rare these days. Just to let you know I got the sign today thanks. It looks fantastic as I thought it would! They arrived today and look stunning. Thank you so much for your hard work on this – they will be appreciated by hundreds of people. Just to say the sign is fantastic, love it, and for the excellent service you have given. Can’t wait to put it up, if i need anymore items in the future i will be straight in touch. Received with thanks yesterday. Really pleased with it. Hi Robin, I received the trivet in time and its great. Thanks very much! Hi Robin, Chris ( my wife) was very pleased with the head-it was a great surprise for her, so thanks for all your hard work on it, and producing such a beautiful piece. I`ve hung it in a place where it gets daylight from the side during the day, which picks out the detail in it, and there`s a table lamp under it at night, so it throws light onto it. Looks great. Thank you very much Robin, I would definitely recommend your work to friends, its very good indeed. The plaque is fantastic with the art deco stained glass windows in the house and a number of other art deco features. The postman has just delivered our name plate (ref: Avenir House) with which we are absolutely delighted! Many thanks indeed for a first class service and superb, high quality design and production. Hi Richard, We purchased one of your cast iron signs for our house, I would just like to say what excellent quality it is and what a great service you offer…from submitting the drawing with the motif I requested on to final delivery was faultless.I will certainly be recommending your business to friends and colleagues. Have a great day. Hi Robin yes it arrived at the office but I was not in until today. It’s fantastic. Thank you so much. Will be sure to send you a picture of the finished product. I have received the house sign this week. It’s excellent. Thank you very much! Thank you so much for the sign. We received it today in the post and it’s absolutely lovely. We’re delighted and I’ll send a photo of the finished arrangement when I get it mounted. It is going to finish off our latest addition nicely. Looks like we’re square on the cost too, so that’s fine. Thanks for making this for us, we could not be happier. Thank you very much for the letterbox – it is just what I was looking for! Hi. Received the trivet today. Thanks. Well worth waiting for. Just a note to say how impressed I am with our letterbox. 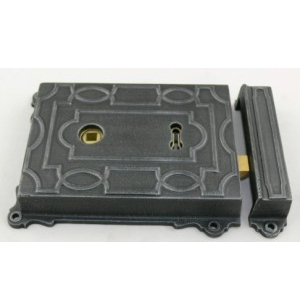 It is rare these days to see such high standards of workmanship coupled with such a professional approach to the initial design of the product. I wish you all the best and will definitely recommend you to friends and family! Many thanks Robin for the Sign & Bracket, received today…absolutely love it…!!!! Thanks got the plaque – absolutely superb! Please feel free to use this as a testimonial and I will be recommending you to everyone I know! The cross is beautiful and your service has been exemplary. Received marker today and we are more than happy with it. Thanks for all your help. I received the name plate yesterday.. I’m very happy and just wanted to say thanks. It’s beautifully done and I look forward to putting it on the house when I move in, in December. Hopefully I will have more business for you then. Received with thanks. It’s just what we wanted. Just to let you know that the Trivet arrived a day or so ago and looks fabulous, I can’t thank you enough for turning this around for me in such a short space of time!! What’s the best way of leaving feedback etc? Hi Robin, just a quick note to say the post box arrived today. We are both really pleased with it. Many thanks. Thanks Robin, it was lovely to see goods still being made in the local area. Just to let you know that we have collected the sign from the Post Office today and are very pleased with it. Just a quick email to say thank you for rushing my order through, I received it today and its great! I have received the letterplate safely this morning and would like to thank you for the service that you have provided, the letterplate is of excellent quality and no doubt you will appreciate that we are thoroughly delighted with the product. Arrived late afternoon yesterday, thanks. Fits perfectly- thanks very much for your help. Got it! Love it! Money well spent. Just to let you know I received my house sign today! It is beautiful and so well made. Thank you so much for your craft and skill, put to such good use! Hi Robin, just to say I’ve received the house sign and I’m very pleased. A really solid item and exactly what I wanted. And thank you for adapting the lettering at reasonable cost to meet my needs. I just wanted to thank you for the superb quality and prompt delivery of our new postbox. We are really pleased with it. It did turn up yesterday, looks great, thank you. A big THANK YOU as the signs are gorgeous and arrived at 6pm last night so i am able to take them away with me today! I am am writing to say a belated thank you for the sign. It is exactly what we wanted and looks perfect in its new position, see attached pic. Just wanted to thank you for the milk box – we love it and it has been put into the fence without any problems! We received the Khanda Trivet yesterday. I would just like to say that it’s lovely and my husband is very impressed. Just to say how delighted we are with our house sign – just what we wanted. Just thought you may like to see your sign fitted to our gate posts in Mallorca. We are delighted with it and the neighbours are jealous !!! Thank you for your good design and good workmanship. Just a quick email to say thank you for the signs, they are fantastic and excellent quality, we are really pleased with them. Thank you so much! I received the trivet today and it is perfect. I have a friend that would love one so I will be ordering another soon. Just to let you know that my order has arrived and also a thank you as it looks fantastic. Many thanks and will mention you to my friends if they ask. also my daughter will do the same and thanks for the excellent service and product. Just a note to say thank you for all the time you have spent on the design of Duncan’s plaque. Daniel and I installed it on Sunday and I thought it looked when I picked it up but when we put in the ground it came into its own – it looked absolutely stunning. Daniel was delighted and he is a hard one to please – he said when people see it they will want to know where we got it from as it is so different from the usual plaques you see!! Again thanks very much and have a good Christmas and New Year. My wife informs that it arrived Highfield and we are extremely pleased.Have left feedback and will come back for another for ourselves. Just to let you know, the letterbox arrived today. It’s beautiful and I am so pleased with it. Thank you for letting me know and well done on an excellent job, we are really pleased with what you’ve produced. Just wanted to thank you for the Trivet which arrived this morning. It’s lovely and I’m very pleased with it. I have just received the parcel today. 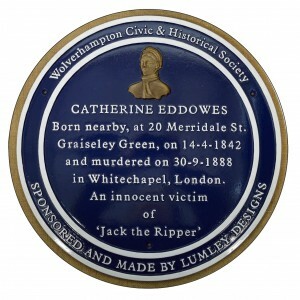 The plaque is fantastic and the workmanship is of exceptional quality. Many thanks for an excellent product and service and I really hope to do business again in future. of them fitted just if you were interested or you could use it for anything. Just to let you know that I have received the house number. I love it. Thank you. just wanted you to know that our letter box and chicken run sign arrived today in perfect condition. We are so pleased with the quality and your excellent designs of the products, so much better than any we have seen. Also many thanks for your help and advice when ordering we shall definately be recomending you to others, your workmanship is amazing. Kindest regards Mrs.L. Richards. Just a quick note to say thank you for the Sedges sign which I received earlier today. It’s exactly what we were looking for. We are really pleased with it. Just wanted to let you know that I have received the trivet and it is lovely. I really love it. I have to thank you for our lovley letterbox, we are over the moon. My order for post gripper bracket received today.Thank you very much,,I am very pleased with it. Recieved the sign today, wow thanks for the speedy delivery. What can i say its fantastic, we are really pleased with it thank you. Its gonna look sooooo good when we erect it & open. If you are in maidstone kent at anytime, pop to have a look at your sign, what a great job & pop in for coffee. My beloved was delighted with the plaque (I gave it to him early because he won’t be going to the stables on the weekend). He loved the black with red lettering as well as the horsehead in relief. I am pleased with the consultation process and the care you took in creating the plaque. The bracket arrived safe and sound today. I didn’t expect it until next week, so that was a surprise. It looks great – I’ve dropped it off at the sign shop to begin work on the sign itself. Thank you for an excellent job. I’ll send you a picture of the completed sign once it’s up. I received your letter plate and I felt the need to write to say firstly thank-you for such an efficient service and secondly to comment on how pleased I was with the quality and high standard of workmanship. I am truely impressed by your work. Lettering safely received on Saturday and is now in place and looks great. Many thanks for everything and it was a pleasure doing business with you – photos will follow in due course. I recieved the house sign i ordered from you today and i just wanted to say how pleased i am with it. Its really beautiful, thank you very much! colleague of mine who is leaving on Friday. You will be very relieved and pleased to hear that the family are happy with the lettering and look of the letterbox, so am I now that I have got used to the different type face than the one I expected! I do want to thank you for all the extra work and commitment you put into creating it for me, and it is greatly appreciated! Once again many thanks for your endeavours, hope you have a good weekend. Marcus was really pleased with the door knocker. He was beaming. Well done. Thanks Robin, the sign looks good. You may well find it generates interest from the other properties up here (my commission rate is very low!!). I just wanted to let you know that we have received our sign and bracket safely and it is absolutely perfect! Thanks so much for doing such a lovely job and so quickly- it’s just what we wanted and we’re sure it will look wonderful once sign-written and hung- we will email photos as requested. The trivet arrived on Friday. Thank you so much, it’s fantastic, exactly what I was looking for. Brilliant. I’m know my wife will love it. The cross arrived at Maiden Newton this morning and they are so pleased with it they sent me a picture on my phone and the lettering is so nice. I wanted to thank you for all your help and the excellent prompt service which you gave. It’s so nice that it will be placed at the top of a welsh mountain. The two ‘Willowbrook Farm’ signs arrived safely yesterday – they look amazing! Thank you so much for all your efforts to get them the way we wanted and all the best for the future. Just a quick email to let you know the sign is great – Both my wife and I are very pleased – It is very nice to have something that is different. 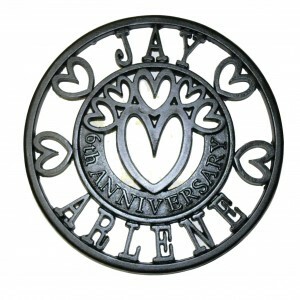 Thank you very much for our lovely personalised anniversary trivet. It is perfect for our 6th “iron” anniversary. Thanks for getting it to me so quickly. Got it today – brilliant. Thank you so much, it is just what I wanted, so grateful. Just to say thank you very much for the brackets received safely Friday morning. They’re great and just what I have been after for the signage job we’re working on. Hope to put more business your way in the future. They’ve been a long time coming and I just hope you think the 3 year wait was worthwhile. I took these shots on Saturday and as you can see the letter box looks as good today as it did when first installed. I have two other photos of the rear and will send these to you separately. Just to let you know that the sign was delivered on Thursday. We are thrilled with it! The door sign has arrived in good order. Thanks for the service. Just to say that the letterbox arrived on Saturday. Many thanks for for your help and excellent service. I went by the house today and it had arrived. I am just opening it up and it looks great. Thank you.